Our first ever user-submitted Beertography of the Week comes from our good friend Mike Kivowitz of NewJerseyCraftBeer.com. 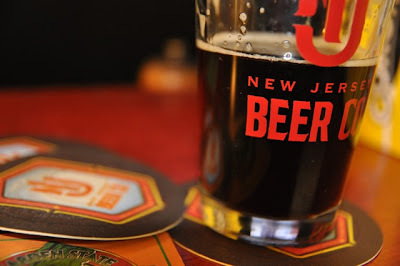 This fine photo features a fresh-from-the-fermenter pint of New Jersey Beer Company's Garden State Stout at the brewery's tasting room in North Bergen, NJ. Thanks Mike! If you submitted your photo, fear not! I'll hang onto all submissions and continue to post them weekly. Do you have a great photo of beer or something beer-related? Send it to beertography@gmail.com and I'll post the best ones in a weekly User Submitted Beertography feature! Blind Bat is a nanobrewery located in Centerport, Long Island where the brewer/owner is only producing a handful of beers as a part-time job. This is one of if not THE smallest commercial brewery in the country. This was the first time I've ever seen anything of theirs in bottle form so I couldn't resist picking it up and giving it a try. It pours a dark but not opaque black and any head formed from the pour quickly disappears. It seems somewhat thin and there's certainly not much carbonation. The aroma is strong of malty sweetness and roasted chocolate malt. The first sip is when the smoked malt is revealed, followed by a glorious applewood attack that leaves me craving bacon or a campfire. The back end leaves you with a hint of coffee bitterness. Wow. Its still surprisingly thin, but that makes it very drinkable. My personal preference is for a bit more body in my porters, but this is really well balanced between the chocolate and the smoke flavors. I've never had a beer that's utilized applewood so well. I'll definitely be on the lookout for more bottles from this fine nano.